You’ve done everything right – put in the time and effort to show that your qualifications match the needs of the employer. And then, out of nowhere, you receive a call to come in for an interview! Your hard work has gotten you this far, but it isn’t over yet. Researching and properly preparing for an interview can be a time consuming, but it may also lead to your next job offer. This time investment be quite overwhelming, especially if you continue to apply to other opportunities while working your current job and balancing finances, family, and relationships. With the unemployment rate hovering at around 5 percent in both the U.S. and the UK, it’s not surprising that there are more products available than ever to assist the overwhelmed job seeker. No place is this more evident than the Apple iTunes App Store, where there seems to be an app for every need. Need help getting ready for that big interview? “There’s an app for that!” No matter what your interest, hobby, or situation, there is something for everyone. 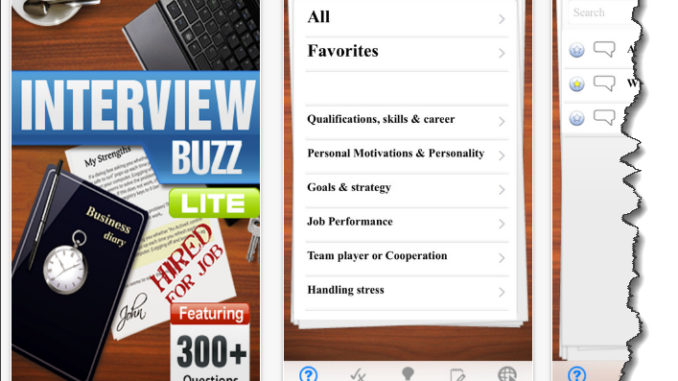 Here are four mobile (free and paid) iOS & Android apps to help prepare you for your big interview – no matter where you are. This app is well-designed, with 55 questions divided into several categories including time management, adaptability, negotiation and more. Each question has answer tips that can be altered and saved, with a space where you can type your own answer to the question. One disappointment is that the user isn’t able to copy or paste text into these fields, but hopefully this will be fixed in future updates. There is also a practice section, handy for quizzing yourself, with additional queries but no answer tips. A search function includes the option to add a search question to a list of favorites for quick reference. Some helpful do’s & don’ts are also included, along with tips on attire, dining etiquette and even a diagram on how to tie a tie (half-windsor only). The app also includes links to RSSfeeds, keeping info fresh and up to date. For an additional 99 cents you can upgrade to the Pro version, which has 255 questions and no ads. Both the infrequent interviewer and the seasoned veteran will benefit from the clean look and easy navigation of this app. It includes information on foods to avoid before the interview to tips on tough questions you may not think of. While there’s not a ton of content, the videos included are concise and well-produced. Associated blog posts with content that is constantly updating is also included. This application’s selling point may be the 72-hour countdown that sends push notification alerts to your device. These alerts direct the user back to the app at vital points in the coming days and minutes leading up to your interview. This helpful and engaging tool is designed to keep you on track to ace that interview. 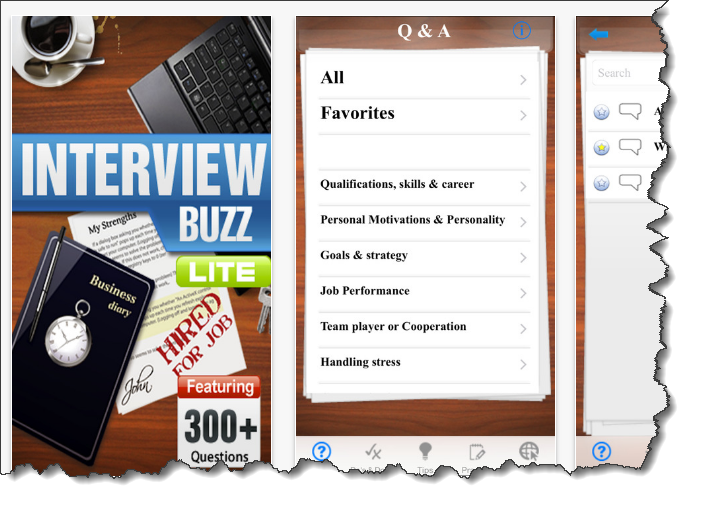 Job Interview Questions and Answers is a free, interactive video app that helps you practice your answers to tough interview questions in an easy-to-use mock interview format. 1. 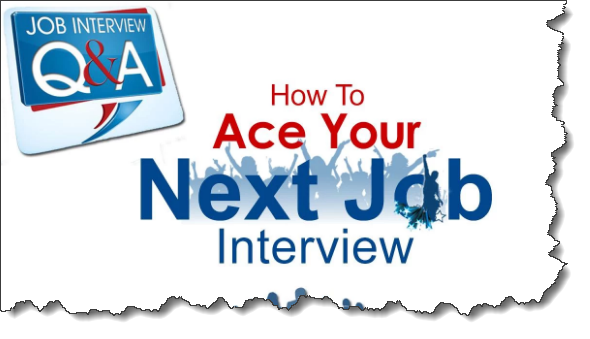 WATCH AS YOU ARE ASKED A TOUGH INTERVIEW QUESTION. These questions are the same ones you’ll be asked in your job interview. 2. RECORD YOUR INTERVIEW ANSWER. This is a unique and valuable opportunity to see what you look and sound like to your interviewer. Is your answer strong enough? Not sure? Job interview is one of the most important thing to get the job you want. Sometimes people failed in job interview because they are not well-prepared to answer the questions. Causing them to lose the opportunity to get their dreamed job. This applications provides you how to avoid those things. Contains top 50 questions and teach you how to answer them. Learn the questions and get your dreamed job with this application!